He was an aristocratic widower whose charming ways could not be dismissed. You were accepted by everyone but the housekeeper, who held strongly to the sophistication and beauty of the first wife. Undaunted, you obsess to win her over, knowing your marriage may depend on it as your husband hold her opinions in high regard. 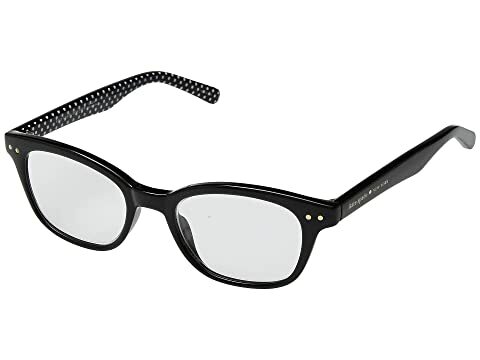 Part of your strategy involves wearing the fabulous Kate Spade New York™ Rebecca 2 readers around the home. Will she find favor with your style and finally accept you? Only time will tell. Sleek plastic frames and arms. Plastic lenses are available in different strengths. Soft protective case with kiss-lock closure included. Product measurements were taken using size +1.00. Please note that measurements may vary by size. We can't currently find any similar items for the Rebecca 2 by Kate Spade New York. Sorry!